According to Citigroup, it could plead guilty to an antitrust charge so as to resolve a US Department of Justice investigation of its dealings in foreign exchange markets. The company said in a regulatory filing on Monday that the Justice Department was not looking forward to prosecute the bank in a different investigation into the setting of interest rates between banks. Over the past year, the banks have been investigated by global authorities, together with the DOJ, in an attempt to manipulate rates in the foreign exchange market. According to reports, the banks have been charged with sharing confidential information regarding client orders together with coordinating trades from 2008 until October 2013 in an attempt to increase their own profits. Costco Wholesale Corp., American membership-only warehouse club, named Citigroup Inc. and Visa Inc. as its new credit partners On Monday. Costco Wholesale Corp announced Citi, the world's largest issuer of consumer credit cards, would become the exclusive issuer of Costco's co-brand credit cards and Visa will replace American Express (AmEx) as the credit card network or Costco in the United States beginning April 1, 2016. In February, AmEx said that it had been unable to reach a deal with Costco on renewal terms. It said that the 16-year partnership in which Costco only accepted AmEx cards will expire on March 31, 2016. After the announcement, credit-card firms teamed up with the fast-expanding wholesale club, which sells everything from car tires to smoked salmon. New Delhi - The government is likely to meet its fiscal deficit target of 4.1 percent GDP for the current financial year, says global brokerage firm Citigroup. The fiscal deficit target of 4.1 percent of GDP for 2014-15 is likely to be met though the fiscal trends are "weak", it said. As per the data released by Controller General (CGA) of Accounts, India's fiscal deficit overshot the budget estimate of Rs 5.31 lakh crore by December-end. However, a "compression" in plan expenditure coupled with a pick-up in divestments, would likely help the government meet its 2014-15 fiscal deficit of 4.1 percent of GDP, it said. London, July 15 : Citigroup has reportedly been directed by the US Attorney General to pay seven billion dollars in order to settle an investigation into sub-prime mortgages which were at the centre of the 2008 financial crisis. Washington: The US Justice Department is finalising a lawsuit against Citigroup over the bank's sale of residential mortgage-backed securities after negotiations to resolve the matter broke down. Two people with direct knowledge of the matter say negotiations between the department and the bank fell apart this week. They said a lawsuit from the federal government could be filed as early as next week. The people spoke on condition of anonymity because they weren't authorised to be quoted by name when discussing a complaint that has not yet been filed. Financial giant, Citigroup has said that it would cut around 1,000 jobs in its mortgage business as the business falls due to higher interest rates and lower refinancing volumes. The New York-based company has said in a statement that the planned job cuts would affect those involved in fulfilment and default roles, underwriting and mortgage sales mainly at the company's Las Vegas and Irving, Texas sites. The bank joins others in cutting jobs at its mortgage business as consumer interest falls in refinancing current mortgages and buying new homes. Citigroup has said that it has agreed to pay about $968 million to Fannie Mae to resolve claims on 3.7 million troubled home loans. Fannie Mae has been seeking compensation from banks for misrepresenting the quality of home loans that were sold to the company during the times of the housing crisis. During the financial crisis, the housing market crashed and homeowners started defaulting on these loans and this resulted in Fannie facing billions of dollars in losses. Thomas Hayes, the former UBS and Citigroup trader, has become the first banker to appear in the court in the massive Libor scandal involving several multi billion pound banks. Hayes from Caterham in Surrey made an initial appearance at Westminster Magistrates' Court on Thursday only to give his name, date of birth and address. He is being accused of colliding with employees at seven banks and three interdealer brokers for attempting to manipulate yen-Libor interest rates. Citigroup Inc., the third-largest bank by assets in the United States, will slash its workforce by more than 11,000 jobs and take a $1 billion charge this quarter to cover workforce reduction. The workforce reduction, which includes 1,900 job cuts in trading, investment banking and transaction services, aims to drag costs down as the banking giant is seeing its revenues drying up globally. The board of global financial giant, Citigroup has approved an award of $6.65 million to Vikram S. Pandit, which was unexpectedly resigned from the company in the previous month. The board awarded the amount for the former chief executive as part of an "incentive" package for his work during 2012. The bank has also decided to pay a similar amount to former Chief Operating Officer John Havens. The bank said that the new incentive is to reflect the progress the bank made in 2012 and work they did in some earlier years. Vikram Pandit, who recently resigned as Citigroup's chief executive officer amid board tensions, may have to forgo nearly $33 million in cash & stock from a retention package. Mr. Pandit was to get $19 million via a profit-sharing agreement, deferred stock worth around $9 million and optional stock worth $4.6 million, according to the company's terms of a May last year regulatory filing. After spending nearly five years at the helm of the world's largest financial services network Citigroup Inc, CEO Vikram S. Pandit abruptly resigned on Tuesday. Without citing any reason, Citigroup announced that Pandit had resigned from the top job with immediate effect. The abrupt resignation surprised the financial world as the resignation came just a day after the company posted stronger-than-expected third-quarter earnings. Global banking giant, Citigroup has decided to sell its stake in Housing Development Finance Corp. for 95.5 billion rupees or about $1.9 billion. Citigroup sold 145.3 million shares at the rate of Rs. 657.56 per share, the company said in a statement. The price level is at 6.2 percent discount to the HDFC’s closing price. The sale resulted in an income of $1.1 billion for Citigroup before accounting for taxes. Citi has downgraded the shares of Hindustan Unilever from 'neutral' to 'sell' after the company announced earnings. Citi has also raised target price to Rs 345 from Rs 330. "A decelerating top line implies higher probability of margin pressures in subsequent quarters," Citi said in a note. It said that the fall of 7 per cent in advertising and promotional spending might put pressure on margins. 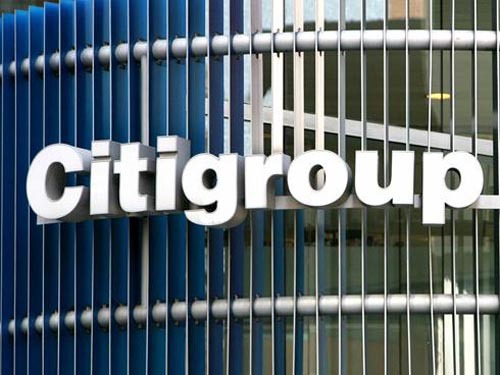 Citigroup Inc. is reported to have reduced its stake in leading mortgage lender, Housing Development and Finance Corp Ltd, with a sale ranging from 1.5% to 9.9%, as it would reduce Citi's holding to 9.9% from 11.4%, ahead of the adoption of Basel III capital rules. Also, the bank was reported to have stated, "The transaction resulted in a pre-tax profit of approximately $160 million. Citi has no plans to sell any additional shares of HDFC. Reducing its holdings in HDFC to below 10% is part of Citi's mitigation efforts". Citigroup Inc. has confirmed hacking of its bank's network and said that computer hackers breached the bank's network and accessed the data of about 200,000 bank card holders in North America. Sean Kevelighan, a U. S.-based Spokesman of Citigroup, said that the company is contacting customers whose information has been stolen. He said that the bank has implanted improved techniques to prevent the reoccurrence of any such incident. According to latest report by Citigroup on Microsoft, the software giant makes $5 for every HTC device sold by HTC. The repot released on Friday said that Microsoft receives the money as part of a patent settlement agreement with the Taiwanese manufacturer, which produces some the leading smartphones running on Google’s android device. Citigroup chief executive officer Vikram Pandit is on a short visit to India. His visit comes at a time when global financial and banking giant is seeking to restructure its work adopting a "back-to-banking" policy and targeting emerging economies like India and China. He recently made an appearance on business channel, CNBC-TV18, where he revealed some of policies he brought about in the bank's core departments. When he was asked about his interest in targeting India as part of bank's growth strategy he said bank can do much better in India. Financial services firm Religare Enterprises has announced that it plans to get hold of Citigroup India's home loan portfolio at just Rs. 500 crore, i. e. five per cent of Citi's total mortgage book. The Citi group has also agreed on this fact and soon there will be a buyout deal between these two firms.